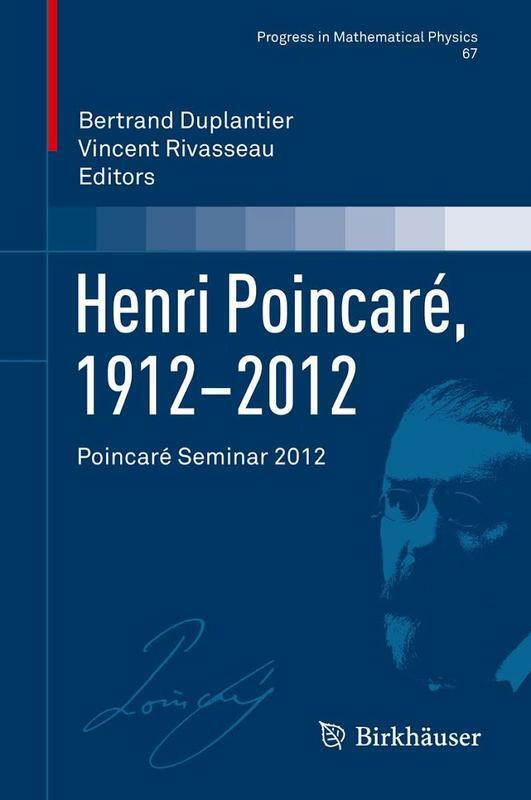 This thirteenth volume of the Poincaré Seminar Series, Henri Poincaré, 1912-2012, is published on the occasion of the centennial of the death of Henri Poincaré in 1912. It presents a scholarly approach to Poincaré’s genius and creativity in mathematical physics and mathematics. Its five articles are also highly pedagogical, as befits their origin in lectures to a broad scientific audience. Highlights include “Poincaré’s Light” by Olivier Darrigol, a leading historian of science, who uses light as a guiding thread through much of Poincaré ’s physics and philosophy, from the application of his superior mathematical skills and the theory of diffraction to his subsequent reflections on the foundations of electromagnetism and the electrodynamics of moving bodies; the authoritative “Poincaré and the Three-Body Problem” by Alain Chenciner, who offers an exquisitely detailed, hundred-page perspective, peppered with vivid excerpts from citations, on the monumental work of Poincaré on this subject, from the famous (King Oscar’s) 1889 memoir to the foundations of the modern theory of chaos in “Les méthodes nouvelles de la mécanique céleste.” A profoundly original and scholarly presentation of the work by Poincaré on probability theory is given by Laurent Mazliak in “Poincaré’s Odds,” from the incidental first appearance of the word “probability” in Poincaré’s famous 1890 theorem of recurrence for dynamical systems, to his later acceptance of the unavoidability of probability calculus in Science, as developed to a great extent by Emile Borel, Poincaré’s main direct disciple; the article by Francois Béguin, “Henri Poincaré and the Uniformization of Riemann Surfaces,” takes us on a fascinating journey through the six successive versions in twenty-six years of the celebrated uniformization theorem, which exemplifies the Master’s distinctive signature in the foundational fusion of mathematics and physics, on which conformal field theory, string theory and quantum gravity so much depend nowadays; the final chapter, “Harmony and Chaos, On the Figure of Henri Poincaré” by the filmmaker Philippe Worms, describes the homonymous poetical film in which eminent scientists, through mathematical scenes and physical experiments, display their emotional relationship to the often elusive scientific truth and universal “harmony and chaos” in Poincaré’s legacy.